WheredoIendandyoubegin – On Secularity, the 9th edition of the Göteborg International Biennial for Contemporary Art (GIBCA), introduces its participants. 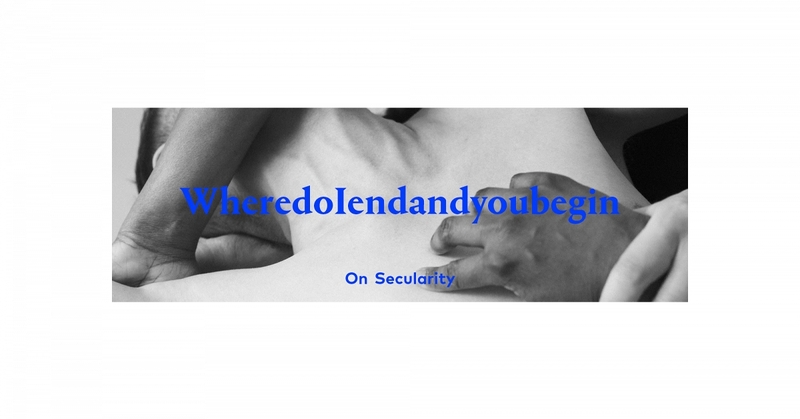 GIBCA 2017, titled WheredoIendandyoubegin – On Secularity, will seek to stimulate public discourse on a subject of contemporary social and political significance: that of the secular. What role should secularity have in society today? Based on the principle of a separation of religious belief and non-belief from the state, contemporary Western liberal secularity strives to create the conditions that produce and protect four civic cornerstones: political and social equality, minority rights, religious freedom, and the legal separation of private and public domains. Secularity, not to be confused with atheism, has played an essential role in society, creating the conditions for regulating complex and often divisive areas of transaction, including abortion rights, sexual freedoms, freedom of religion, gender equality and freedom of expression. Its strength lies in allowing different modes of living to co-exist due to protections and rights provided under the law and has taken many forms around the world. GIBCA 2017 looks to address such complex questions on the status of secularity in the situation of its crisis. In the midst of the geo-political upheaval that continues to take place since the beginning of the 21st century, together with an increasing consciousness of fear and precarity, liberal secularity finds itself under acute pressure. Numerous profound questions emerge about the future. What happens to secularity during moments of crisis? How can we sustain freedoms—social, sexual, cultural or religious—in a situation of stark cultural differences? What do we mean by “belief” today? Is secularity itself defined, as some scholars believe, by relations to perceived others? Is it the state that is best positioned for defining secularity? If not, who should? The biennial will seek to engage with some fundamental questions about Europe, the formalisation of its values, and the fine line between protection and violence. Art, as a field that has a historic foot in the spaces of religion and its contemporary foot in that of the secular, has an important role to play in this debate on the relations between governance, belief and freedom which form the foundations of this biennial. With the participation of approximately 30 artists, WheredoIendandyoubegin will be a multi-faceted event, comprised primarily of an exhibition of art and historic artefacts, with numerous site-specific art projects developed in collaboration with different constituents and organisations in Gothenburg and beyond. Exhibition displays and programmes will be presented at the Röda Sten Konsthall, Göteborg Konsthall and many other sites around Gothenburg, including the Gothenburg City Library who will host a selection of film and video works from the Nordic Region, primarily focused on the 1990s. GIBCA will also collaborate with Platform for Artistic Research in Sweden (PARSE) based at Valand Academy on a special issue of PARSE Journal considering the subject of Secularity, as well as on a section of the 2nd Biennial PARSE Conference taking place in November. The title WheredoIendandyoubegin is taken from an artwork by Shilpa Gupta, which will be exhibited as part of GIBCA 2017. GIBCA is one of the leading Nordic art biennials. Since 2006 the organiser of GIBCA has been Röda Sten Konsthall.